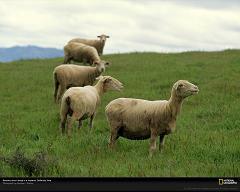 Wool is produced from sheep, but the hair of some other animals is also sometimes called “wool”. Wool has is unique from from hair or fur because its scaling and crimp make it easier to spin the fleece by helping the individual fibers stay together. The crimp means wool fabrics have a greater bulk than other textiles, and traps air which retains heat, making it much warmer than fabrics like cotton. Wool is more fire resistant than most synthetic fibers, and is resistant to static electricity because wool fibers are hygroscopic. Some of the lowest grade of wool is used for felt on pool tables, in shoe insoles, and on piano keys. Other uses for low-grade wool include car insulation, ballet-shoe toe padding, baseball winding, and pads for hazardous waste and oil spills. Because wool can absorb between ten and thirty times its own weight in oil, it is the perfect material for large cleanup tasks. The oldest known European wool textile in the world from 1500 B.C. was preserved in a Danish bog. Who invented Stainproof Carpets and How does du Pont make Stainproof Carpets?